We are Tibor Horvat, MSc, and Joël Gerber, MA, and we run this web page completely on our own. Mr Horvat holds a Master’s degree in Economics, Political Science and Media Studies, and Mr Gerber holds a Master’s degree in History and English Language and Literature. Furthermore, we are both certified teachers of German as a foreign language / German as a second language. Due to our profound interest in ethnic minorities, we decided to launch a web page on the Slovenes living in Hungary in 2005. The project of our website, to which we have been devoting ourselves with great commitment in addition to our actual professional activity and under our own auspices and without any financial support, enables us to discuss the eventful history and diverse culture of the Slovene Raba Region. Furthermore, Mr Horvat has an own, very personal connection to the “Vendvidék” since he hails from Apátistvánfalva/Števanovci from his father’s side. In the year 2005 we were the first to start making available to the general public extensive online information on the Slovene Raba Region/Vendvidék. Mr Horvat, who is a native speaker of both Hungarian and German, translated the Hungarian source texts into German. Subsequently, Mr Gerber, a native speaker of German who has studied English Language and Literature, attended to the translation from German into English. According to the 2011 census, the community of the Slovenes in Hungary consists of almost 3 000 people and is in danger of falling into oblivion. With our website we want to make a contribution to the preservation of their cultural heritage. 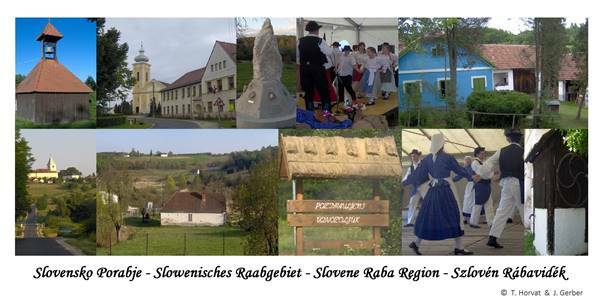 It is our goal to introduce the Slovene population living in the Hungarian Raba Region to a broader international public and in doing so to particularly inform the Slovenes from the Raba Region, and their descendants respectively (hence the bilingual version of our home page) living in the English and German-speaking areas about their origin in their mother tongues. Driven by our distinct interest in the history and culture of ethnic minorities, we therefore explicitly pursue the goal of an active promotion of minorities, in our case the preservation of the manifold history and language, and the traditional habits of the Slovenes from the Raba Region in the cultural memory of the people living outside the “Vendvidék”. In the last few years, we have frequently attended the public events and festivities taking place in the seven Slovene villages of the Porabje periodically, not least in order to gain personal impressions on site which we then publish as brief reports under the rubric “Our Reports” on our website. This journalistic work makes it possible to keep the Slovenes from the Raba Region living outside the Porabje, who are neither able to speak Slovene nor Porabian, up-to-date on the latest developments in their region of origin, and to give them an understanding of the culture of their ancestors respectively. Many people have already become enthusiastic about the Slovene Raba Region. Now it is your turn to go on an expedition to the fascinating Raba Region and to get to know the rich history and culture of the people of the “Vendvidék”! * The “Vendvidék” is also called “Slovene Raba Region”. “Vendvidék” is a Hungarian expression meaning “the country of the Wends/Windish-land”. This term primarily designates respectively designated the Slavs/Slovenes living in the south-eastern Germanic language area. Due to the immigration of the Slavs into the German-speaking area in the 7th and 8th century, this term was used by the Germanic peoples as a synonym for “the foreign”. This appellation became a loan word in Hungarian, and even today it is still a term commonly used in everyday speech to describe the Slovenes living on Hungarian territory (Hungarian vend, and vendek in the plural form respectively*). The area itself became known by the name of “Raba Region”, and of “Slovene Raba Region” (Slovene Porabje/Slovensko Porabje) respectively. This terminology, and the practice to refer to the Slovenes in Hungary as “Slovenes from the Raba Region” respectively originates from Slovenia itself. The expression “Slovenes from the Raba” which designates the Slovenes living in the catchment area of Monošter/Szentgotthárd appeared in the Slovene press already after the First World War. After the Second World War, they used to be called “Slovenes from the Raba river bank” more frequently as well. In a geographical, cultural, linguistic, and an ethnic point of view, the Raba Region/Porabje belongs to the Mura Region/Prekmurje (Slovenia). These two areas once formed a geographical unity until they were separated in 1919. The Mura Region was annexed to newly-founded Yugoslavia (SCS state), whereas the Raba Region remained under Hungarian sovereignty. Due to the Treaty of Trianon (1920) and later as a consequence of the existence of the Iron Curtain, the Slovenes from the “Vendvidék” were separated from the rest of the Slovene people for decades. The “Vendvidék” is located in the border triangle of Slovenia, Hungary, and Austria, in the catchment area of the border town of Monošter/Szentgotthárd and is flown through by the small River Raba, which gives this hilly region the name of “Raba Region”. The picturesque national park of Őrség (Slovene Goričko), which lies in the south-west of Hungary and is famous for its rich flora and fauna forms also part of the “Vendvidék”. Within the Raba Region, which extends over an area of about 94 km2, there are seven Slovene-speaking villages: Gornji Senik/Felsőszölnök, Dolnij Senik/Alsószölnök, Sakalovci/Szakonyfalu, Slovenska ves/Rábatótfalu, Števanovci/Apátistvánfalva, Ritkarovci/Kétvölgy, and Andovci/Orfalu. The small border town of Monošter/Szentgotthárd with its inhabitants of Slovene and Hungarian descent is the economic and cultural centre of the Slovenes from the Raba Region. The Slovene minority in Hungary lives in the Raba Region, in Szombathely (the principal town of Vas County), and in other parts of this West Hungarian county, furthermore in the counties of Somogy, Győr-Moson-Sopron and Budapest, and dispersed in other regions of Hungary.